This two-colour Spanish leather purse features the lucky Indalo, widely recognised as a symbol of good fortune and protection. It also has the words Costa de Almeria, referring to the coastal area of Almeria in south east Spain where the Indalo symbol is mainly to be found. This purse would make a lovely gift for someone that has moved away from the area and needs a little reminder of their roots, or indeed anyone that enjoys this area of Spain. Dimensions: Purse measures approx 13cms by 7cms and fastens across the top with a zip. 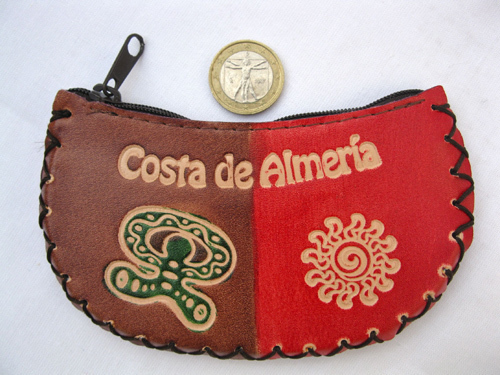 Send this unique 'Indalo - Costa de Almería' purse to a friend or colleague to wish them luck and prosperity. Comes gift-wrapped, like all our presents (with an information card about the Indalo) - and we can print a personal message on your behalf.